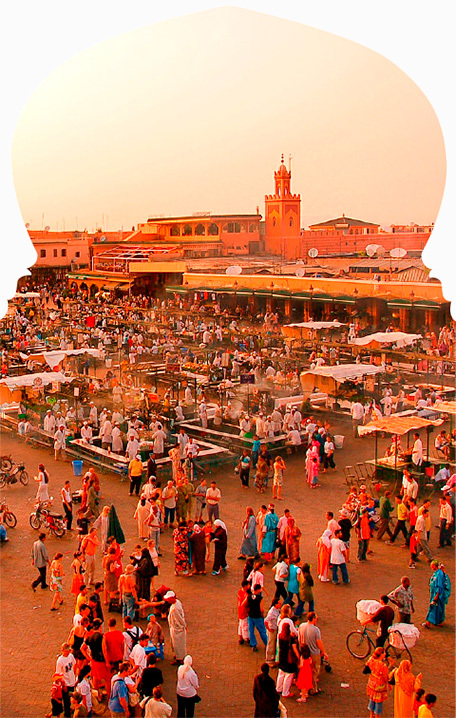 With its special charm, Marrakech does not stop enchanting its visitors. It is a city divided by a Wall. , and Within the walls you will find The Medina, the old town and where you can find the Zouk, the arabian market in which you can find absolutely anything. Outside you have Guéliz, the modern área, the heritage of the old French protectorate that was once long ago Marrakech. Jemaa the Fna square is the heart that pumps life to The Medina. Every evening, after five o’clock, the Square changes its identity: the ambulant dentists, water sellers, snake charmers and the rest of the merchants disappear, and collective restaurants constituted by 60 stalls, open its doors. An environment of fair is created that accompanies the exhibition and get rid of halacas, ephemeral circles of bodies crowd round the halaiqui, which is a rudimentary musician, an acrobat or a reader of fairy stories, a complete art that has earned the Square inclusion in the list of Cultural Immaterial Patrimony of the UNESCO. Marrakech is a city full of magic at the gates of the desert and at the foot of the Atlas mountain range, and is a real oasis where it is possible to experience the delight of all the senses.